20th Mar 2016 11:00 am. It was a perfect weather with temperatures hitting just around 22°C and perfect for a day in the sun.This is what, it was when we entered the arena of Festival of colors at historic Barwon Park Mansion, Winchelsea.Built in a bluestone this pretty 42 room Mansion with stables is built in 1871 on a Victorian rural landscape. 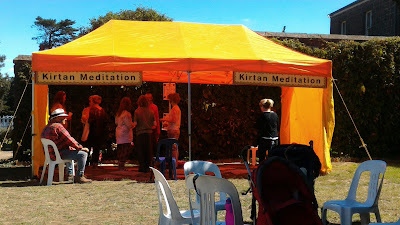 The event was organised by ISKCON Melbourne. Actually, the main event organisers and crew members are from – Hare Krishna Valley which is one of ISKCON’s farming community. 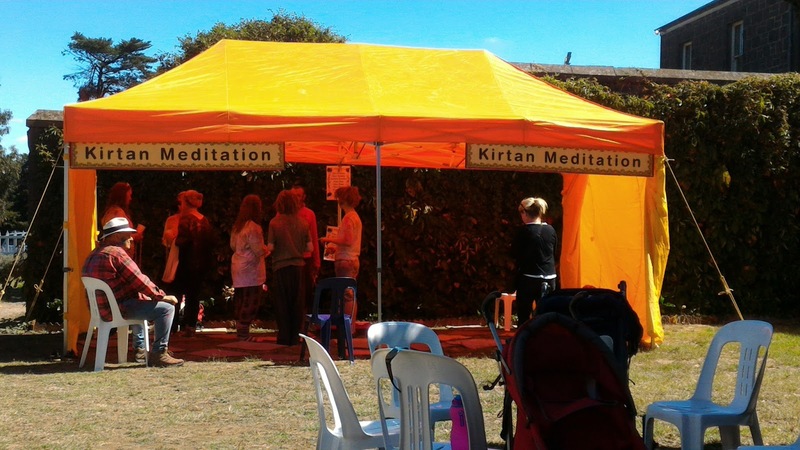 It was a well organised event with facilities like, Toilets, Car Park and also stalls featuring some of Hare Krishna’s delicious dishes etc. 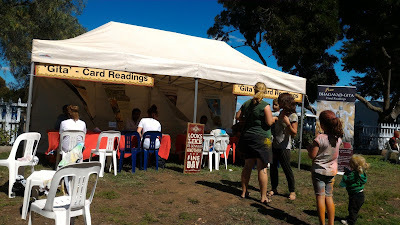 Then, there was some other stalls and designated areas like Book Shop, Hare Krishna Mantra Meditation tent, Bhagavad Gita Card reading, Jumping Castle for kids, Henna Body art etc.However, the and center of attraction was the live Music stage and stage performances by various artists. I played Holi after a long time and had fun. 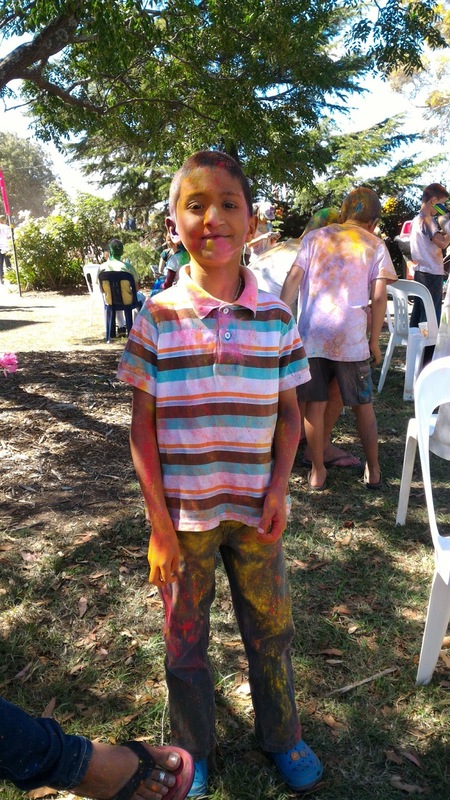 My eldest son enjoyed the coloring part very much and he finished packets and packets of colors – spilling colors everywhere I guess.The best part was, all the colors are organic and wouldn’t stain your clothes, body or place where they are thrown. 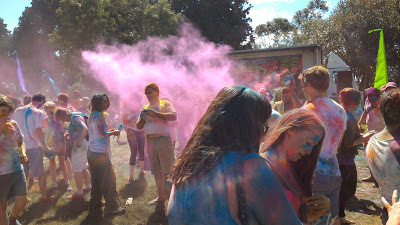 Holi is a age old festival of india celebrated traditionally for two day. On day one, all the clutter and junk in the house is burnt, which is synonymous with killing of a demoness Holika. The scriptures say that, in the days of yore there was a small boy called Prahlad who is the son of the greatest of demons called Hiranyakashipu.The name Prahlad means – always joyful with love of God and Hiranya means Gold and Kashipu means a soft bed. So the father was a gross materialist who did not believe in God and son was totally spiritual and a transcendentalist.So, this was the basic incompatibility of the demoniac father. He did not like his own son worship in the Supreme God Vishnu, whom he hated. He ordered his sister Holika to Kill Prahlad. Holika a demoness had a magical blanket which if one wears, will not be burnt in fire. So she entered a huge fire, wearing this blanket and holding Prahlad. Then, suddenly there was a huge wind which blew away the blanket she was wearing and Holika was burnt to ashes in no time. Meanwhile, the little Prahlad who was always absorbed in the thoughts of God remained perfectly fine and the fire did not harm him at all. 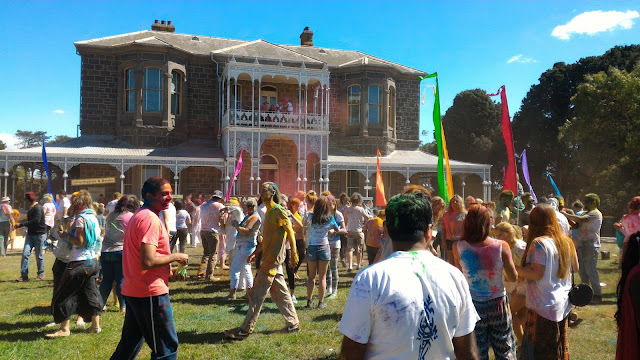 Holi is celebrated in all parts of India but, it is especially (Albeit two days before the Holi) celebrated with zeal and fervour of Radha and Krishna in Mathura, Vrindavan and all over Vraj. 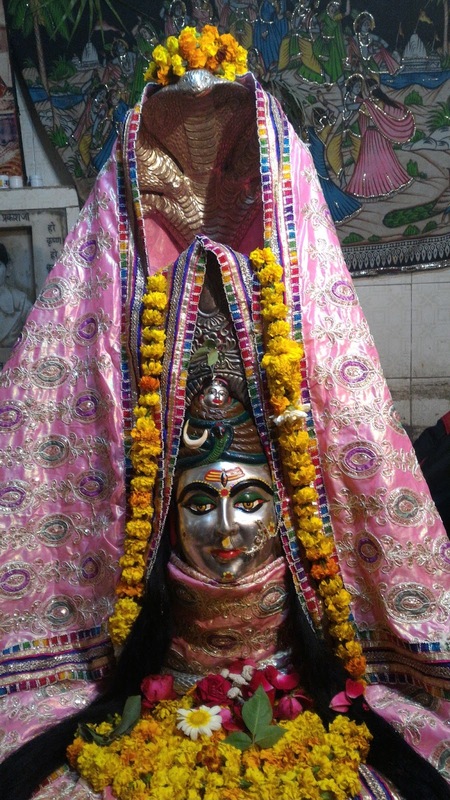 In Barsana the place where Srimati Radha Rani grew up and Nandgaon where Lord Krishna grew up the holi is not only played with colors but, women of Barsana hit the men of Nandgaon with sticks mockingly and the men carry shield to protect themselves from this beating by womenfolk. Why is this so? The history says that one time Lord Krishna visited his beloved Radha's village on this day and playfully teased her and her friends. Taking offence at this, the women of Barsana chased him away. 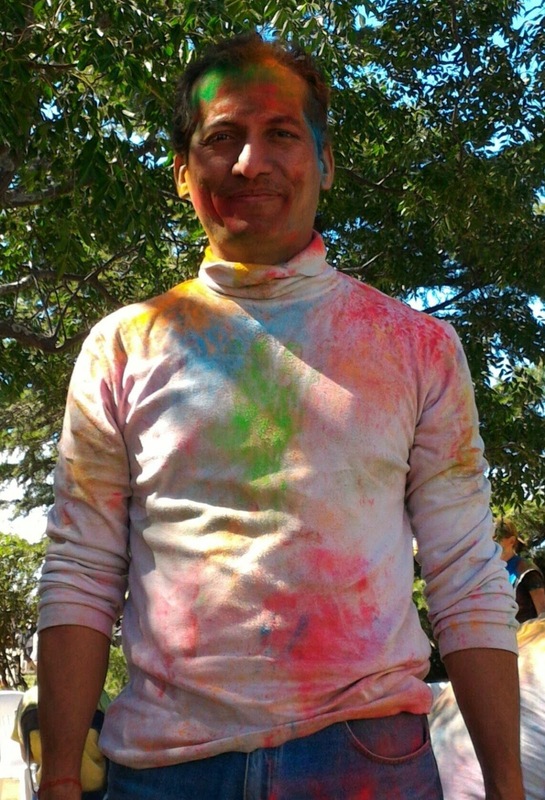 Since then, men from Krishna's village,Nandgaon, visit Barsana to play Holi. 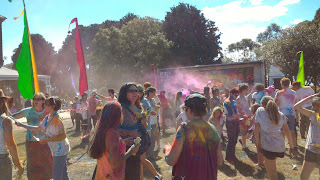 Finally late noon, after a wonderful time playing Holi and having a delicious lunch headed back to Melbourne with my family. I look forward to this event in 2017 and would highly recommend everyone to join this family fun - The festival of colours. You may or may not have noticed and did not happen in your part of the world. Recently there was a Solar Eclipse on March 8th and here are some of the photos from the wonderful cosmic event. Unfortunately it could not be seen from Melbourne. 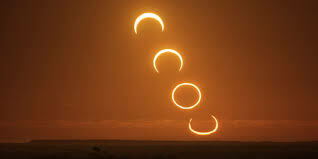 Since childhood, I have a great passion for eclipses and especially the solar eclipse because, it is more volatile or happening on your face, during the day than a lunar eclipse which happens when you are in bed or indoors. 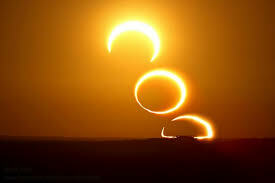 And it is an astrological marvel and a wonderful event to see it, taking place right in front of our eyes. As a child this used to evoke a bit of thought process, about the universe, the planets, Sun called as Surya Narayana.In Hindu tradition actually, the time of eclipse is a big thing. 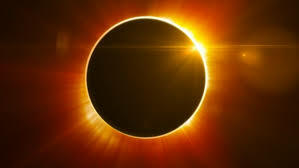 Means, there are so many do’s and don’ts observed during the time of eclipse. For example, pregnant women are not allowed to be exposed to the Sun or Moon light depending on what eclipse it is.Infact they are not even allowed to move out of their bed, sleep in a straight position (except for emergency). Not allowed to cut any vegetables and close any doors and so on. 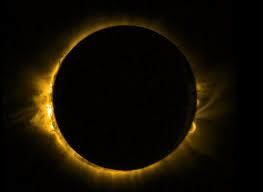 It is believed that the harmful rays during the eclipse cause Congenital defects and harm to the foetus. And then, during the period of eclipse we are not allowed to eat anything, nothing is cooked in the kitchen and if something is cooked, that is consumed and thrown away. For some long life products like Milk, Yoghurt and pickles, Kusa grass (a type of grass found in India) is placed on the food containers. It is said that, once you keep the kusa grass, the items can be consumed afterwards. Recently, I read somewhere that Kusa Grass has this property of absorbing the harmful ultraviolet rays released during the time of eclipse. Then lot of people take a dip or bath in the rivers and pray to the gods for Moksha or liberation. It is believed that whoever takes bath during an eclipse in a holy river like Ganges gets moksha or liberation. So does everyone – thousands of people who take bath get liberation? This was a question asked by Mother Parvathi to Lord Shiva. And Shiva answered that, not everyone who takes bath gets liberation but, one who takes bath with devotion and pious mind will get Moksha and that will be about 10 or 15 out of thousands. Here is an interesting excerpt from Srila Prabhupad’s Lecture on Bhagavad-gita 16.8 - Tokyo, January 28, 1975. “So this is called jagat. Everything is going on. But it is going in such a way... Just like these cars are moving with high speed, but they are very careful to pass within the lane. Otherwise there will be collision. Similarly, all these planets, they have got their own speed for rotating, and there are hundreds and thousands and millions. They are rotating, but there is no collision. Now, how it is made? Who has made this lane? A car is moving in sixty miles, seventy miles speed, but they are ordered just to remain within the lane, the marking line. Who has made it? The police department, the government. So how can you say there is no control? We have to... This is called upamā, analogy, the points of similarity. Analogy means the points of similarity. Then you can conclude some idea. Now, as we see in the street that the cars are moving in high speed but they are within the orbit, within the line, demarcation of line, white line or yellow line, so there is some brain, there is some management, everything is there, Similarly, all these planets, they are rotating with high speed. Just like this planet. It is rotating 25,000 miles in twelve hours. Is it not? The circumference of this earth is 25,000 miles and... Yes, day and night, twenty-four hours. Almost one thousand miles per hour it is... Now the car is moving seventy miles per hours. It appears very with good speed running. But the earth is running at one thousand miles per hour, but we cannot understand. The arrangement is so nice. The perfection that it is... We cannot understand it. It is practical. We see the morning, day, coming. That means earth is moving. When the aeroplane moves also, there are so many jerking, those sound. They're all imperfect. But here you see that such perfect arrangement, it is moving one thousand miles per hour, and there is no jerking. There is nothing of the sort. We are thinking, "We are sitting in the same place." And there is no brain? Here it requires so much brain to move the car orderly on the street. So many police has made, so many government, scientist, this, that, so many, and this not only one planet, but many millions: yasya prabhā prabhavato jagad-anda-koti [Bs. 5.40]. First of all there are many millions of universes, jagad-anḍa-koti. Koṭi means unlimited. Or 100,000 times 100,000. 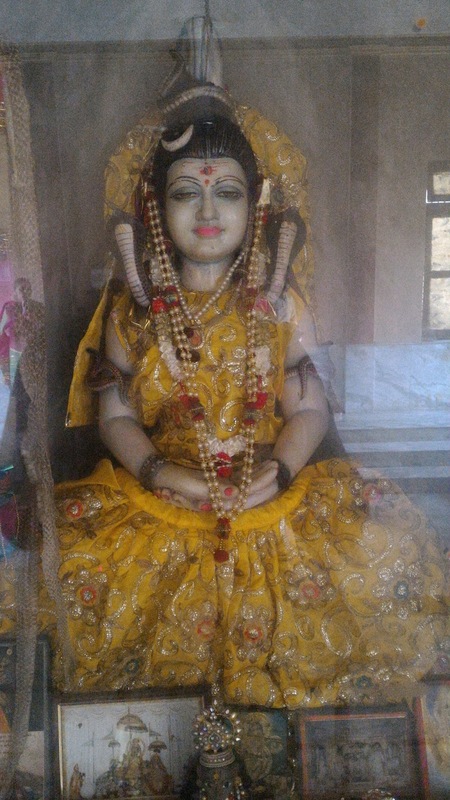 So yasya prabhā prabhavato jagad-anḍa-koṭi-kotisu [Bs. 5.40]. And each universe... Kotisu asesa- vasudhadi. Vasudha means planet. Just like this is one planet. Asesa. Asesa means you cannot count, so many. That's a fact. You are seeing every day. Asesa-vasudhādi-vibhūti. And each planet has got different climate, different varieties, not that every planet is of the same. Now they are studying that the moon planet is also planet, but it is differently situated. Differently situated, as they are studying, that is different from the śāstras, but there is difference from this planet to that planet”. I had recently been to Vrindavan and upon my visit to the holy place realised the fact “Vaishnavanam Yatha Shambu”. It is said that Lord Shiva is the greatest Vaishnava. 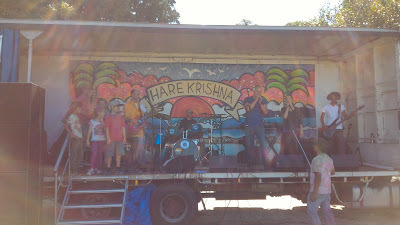 So, no wonder where Krishna is doing his pastimes, Lord Shiva is there. We see a proof of this in Braja Mandala ,Vrindavan where Lord Shiva appears as Mahadev, Keshtrapal (Protector of Dham).Thus, it is said that anyone visiting Braj requires to take the permission of Mahadev to enter the dham. Featured Photo is taken at the entrance of one of the famous Shivji temple in Vrindavan, called as Gopeshwar Mahadev, where Lord Shiva is dressed as a Gopi. The pastime is that one time Lord Shiva, along with mother Parvathi visited Vrindavan during the pastimes of Lord Krishna and wanted to enter the Rasa Lila dance of Krishna with Gopis. Lord Shiva was stopped and was explained that in Vrindavan pastimes, there is only one Purusha or the enjoyer and the rest are Prakriti or the enjoyed, existing purely to serve the Lord. Lalitha Sakhi, a confidential sakhi of Radha rani took Lord Shiva to a Kund (pond) and asked him to take a dip. 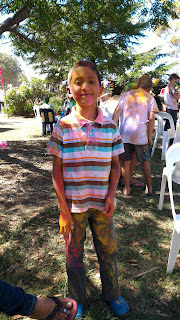 Once he came out of the Kund he transformed into a beautiful Gopi. And there are so many other temples of Lord Shiva like, Chakleshwar Mahadeva near Manasi ganga at Govardhan, Nandishwar Mahadeva in Nandgaon and Bankhandi Mahadev in Vrindavan, Kundeshwar Mahadev in Radha Kund, Kedareshwar Mahadev, the Kedarnath temple located in a remote corner in the Braj mandala parikrama marg, Kameshwar Mahadev and many others. Even in Mathura Lord Shiva’s temples surround the town in all the four corners. 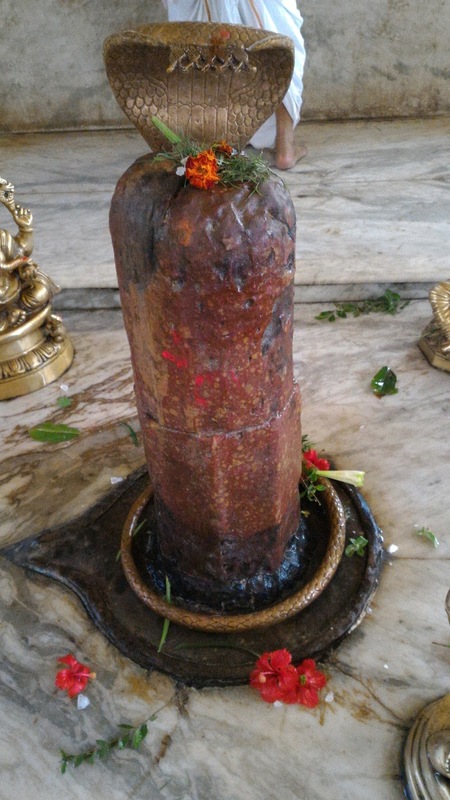 There are 4 Shiva lingas located in the four corners to protect the city, called as the dik-pala of Mathura. They are namely, Gokarnesvara Mahadeva in the north, Pippalesvara Mahadeva in the east, Rangesvara Mahadeva in the south and Bhutesvara Mahadeva in the west. The below photos are from a place called Aasheshwar Mahadev, near Nandgaon where Lord Shiva sat down in meditation with Aasha – a hope or desire to get a darshan of baby Krishna. The story goes that, once Lord Shiva visited Nandgaon disguised as a Babaji covered with ashes and snakes hanging around his neck and knocked the door of Nana baba. Mother Yashodha was shocked to see the form of Babaji and feared that her little baby Krishna would be scared to see this Babaji, she refused to show him. Then Mahadev left that place and at a distance sat under a tree and started meditating on the form of Baby Krishna for his darshan. Meanwhile, Lord Krishna who is the Supersoul and Paramatma understood the desire of Shiva and suddenly started crying incessantly. Then, the woman folk of the village explained to Yashoda Mataji that probably, she might have offended the Babaji by not letting him have look at baby Krishna. Then, Mother Yashoda took baby Krishna to the place where the Babaji was meditating and immediately upon seeing him, Krishna started smiling happily.Mother Yashoda requested the Babaji (Shiva) to live permanently in Nandgaon so that Krishna is always happy. And, Shiva agreed to stay on the condition that everyday, the prasadam of Krishna is given to him. And, it is a custom that is still followed today at Nandgaon temple.